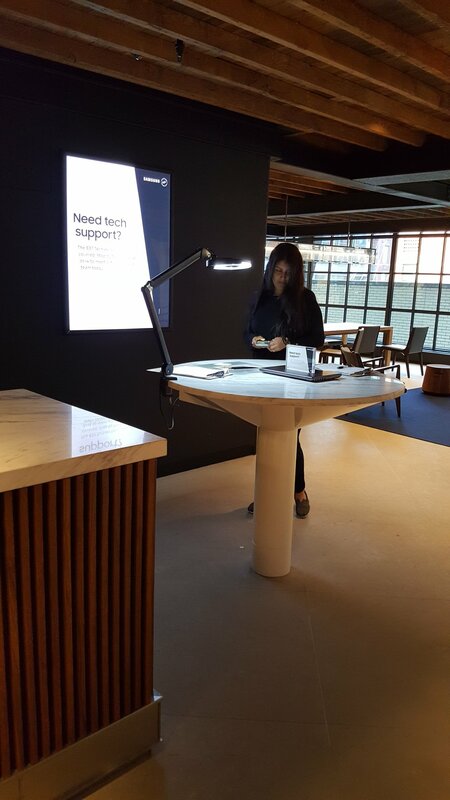 Samsung's 837 store in Manhattan's Meatpacking District provides tech support along with a dazzling display of technology-based entertainment and experiences. It’s the conundrum all of us freelancers and solopreneurs face at some point. You’re never more on your own than when your computer, printer, tablet, or in my most recent case, my smartphone, goes on the blink. In the midst of a trouble-shooting phone session with Samsung, as I was cringing at the thought of being without a smartphone for two weeks, I learned I could instead visit the NYC store for onsite tech support. There’s a Samsung store? Where I can get help in person? I headed down to the Meatpacking District where I came upon a three-story space a stone’s throw from the High Line and the new Whitney Museum. A ha! I thought as I surveyed the cobblestone streets and trendy neighborhood surrounds. This must be Samsung’s answer to the Apple Store. Does it ooze the same cool factor? I was about to find out. Open since February, 837 (after its address on 837 Washington Street) is a bit of a hybrid. It mixes three stories of showroom, entertainment, hangout space, workspace and coffee bar within its 55,000 square feet. And of course, the help desk I desperately sought. Notice I didn’t say retail. Because while they have more technology on display than you might see at CES, it’s not for purchase. However, you can test drive all the headphones you want. Samsung describes 837 as the “physical manifestation of the company’s brand.” I would say it’s a somewhere between digital playground and immersive experience. Translated: serious wow factor, even for non-techies. Large window displays with cozy lounge chairs provide hints of the high tech experiences inside. I watched as people lined up to take their turn at a Visual Reality experience. It reminded me of what might happen at an amusement park, but in this case, it’s a moving 4D chair. Once in the store, I couldn’t miss 837’s most arresting feature: the two-story high wall of large-screens. Ninety-six 55-inch screens span a wall for a jaw-dropping visual display visible throughout much of the store. But it is probably best experienced from the wooden bleacher-style seating that prominently occupies the ground and lower levels of the store. On my first visit the screens displayed a series of rotating facial images. Apparently the screens are set up so you can beam your face onto the screen for as long as it takes to Instagram it. On my follow-up trip a few weeks later, it was a bigger-than-life viewing of the Olympics diving competition. I stopped to savor it along with a large contingent of locals and tourists. Not only was it quite spectacular, it was a very cool escape from an oppressive August heat wave. Besides sports spectaculars and Instagram opportunities, the theater holds regular viewings of special events (follow 837 on Instagram for the most up-to-date schedule). 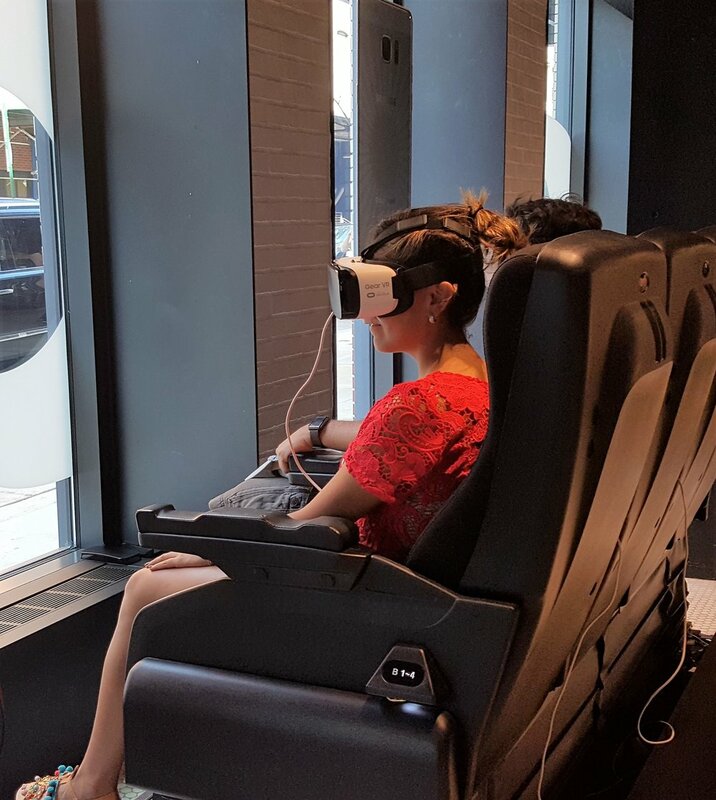 Upstairs is a café, lounge areas, tables and chairs, a kitchen display and the VR Tunnel, where you can experience the Gear VR headset and its capabilities first hand. While I wouldn’t exactly say it looked like a weekday morning at Starbucks, I saw several people camped out with their laptops. Did they come there to work? Get out of a non-air-conditioned apartment? I didn’t ask. In fact, it was so hot outside, and so cool inside, it was hard to gauge who was there to dabble with the new technology and who just wanted to get some relief from the heat. 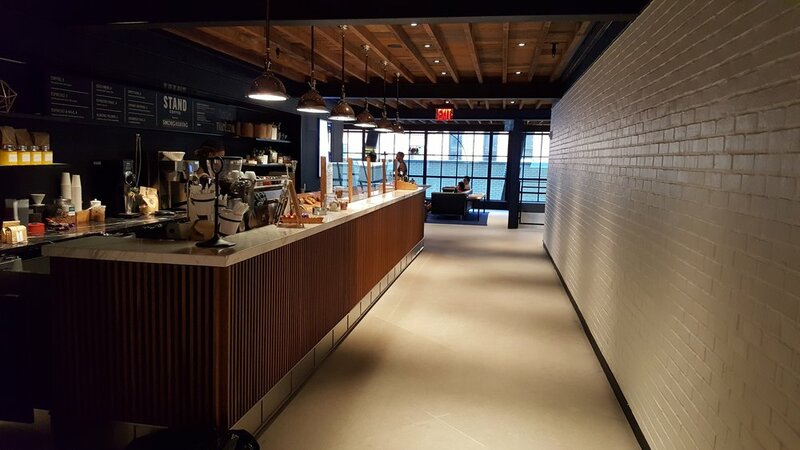 Maybe that's why unlike a coffee shop that functions as an ersatz workspace, many 837 visitors brought along a friend. While the coffee and pastries looked tempting, surprisingly, no one was at the café counter. For that matter, I didn't see anyone nursing a coffee at a worktable or loung seat. Maybe they didn’t feel obligated to buy anything since they were so clearly welcomed elsewhere in the space. I found the kitchen room set a bit incongruous. Sure, I know Samsung makes major appliances. But the refrigerator and the washer dryer combination felt a bit out of place in the midst of this tech heaven, even if they did have the latest digital commands. At the top of the steps I found the troubleshooting area that inspired my trip. Turns out Customer Service is a bar-height table staffed by a couple people who ask you to sign in on an old-fashioned clipboard. After a brief wait, a support person was able to successfully extract my stuck stylus. Unfortunately, no replacements were in stock so I would have to come back another day. I did not find the Samsung staff to be particularly hospitable on either visit. I guess that’s not what they’re selling. In fact, on my second visit, when I came to pick up a replacement stylus, I was actually admonished by the help desk staff who rather rudely told me, “We don’t just replace a stylus when anyone asks. That would be $45.” I passed. It wasn’t until I was halfway down the block on the way to the train when I remembered my device was not even six months old. I turned around and headed back to 837. I encountered the same tech support person and called the short life of my device to his attention (note he never bothered asking me how old it was). He sauntered over to the stockroom to find me a replacement. That is, of course, while he had his associate document my warranty (good through April 2017 Mr. Tech Support. This is August 2016). He then rather sheepishly stuck one in my hand. I didn’t so much mind that it wasn’t the exact color match of the one I was replacing. But it was like he grabbed it out of a spare phone display. No packaging, no nothing. Did I get a reconditioned stylus? I’ll never know. And while no one rushes you out or pressures you to buy something (because nothing is for sale), I still did not get a warm or welcoming feel from the overall experience on either visit. It was certainly nothing like I’ve heard the Genius Bar described by my Apple-loyal friends and family. So while I was relieved to have my problem fixed on the spot, and avoid a phone-less existence for two weeks, I don’t think I’ll be returning to hang out at 837 anytime soon. However, it is good to know that live tech support exists a short subway ride away if I ever get in a similar bind, warranty or no warranty. Come to think of it, maybe next time I’m walking the High Line or visiting the Whitney, I’ll stop in for some coffee. The barista looked like he could use some company. What about you? Who do you turn to for tech support? 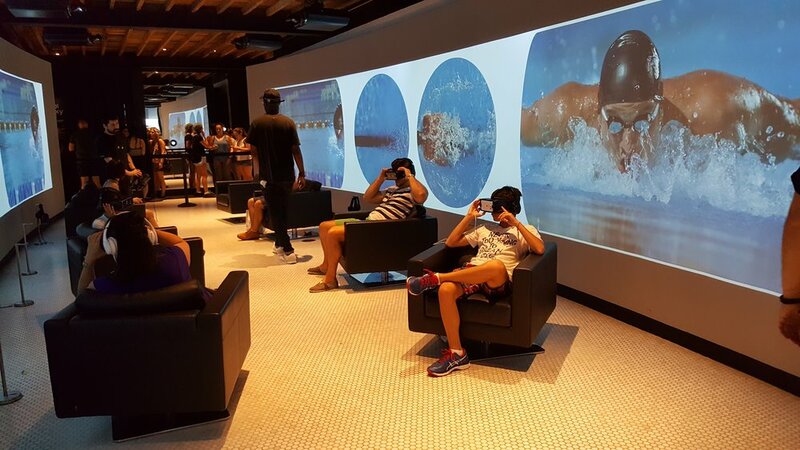 One of several virtual reality experiences at Samsung's 837 store. A selfie station allows you to bean your image onto the two-story screen so you can Instagram it. The Amphitheater accommodates up to 75 people in bleacher-style seats. Watching Olympic diving on a bigger-than-life screen was a transcendent experience. You can see the massive screen (96 55-inch displays) from all three floors. Getting in line to partake of a Samsung experience. Among the many art-meets-technology experiences is the Social Galaxy where your Instagram feeds onto a display wall. Rows and rows of headphones to test, but not buy (no retail sales at the store). As part of its connection to the local NYC community, Samsung partnered with Smorgasburg for the 837 cafe. The cafe was rather quiet, perhaps because no one feels obligated to buy a latte to claim their space. 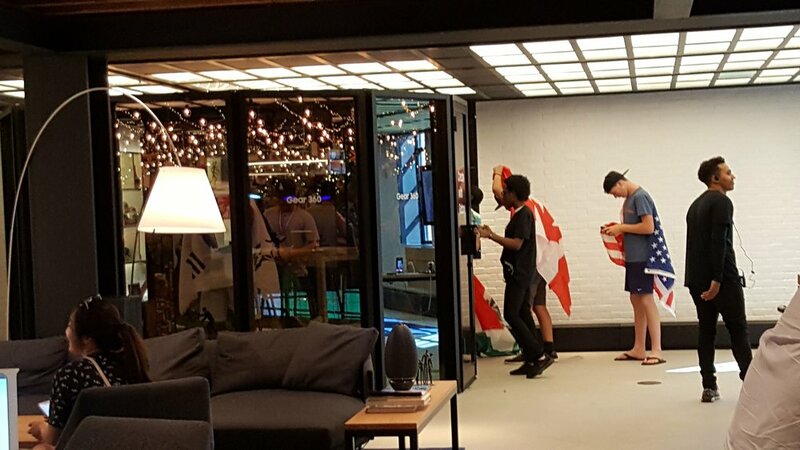 In the midst of a heatwave, locals and tourists made themselves at home in the Samsung Living Room, designed to showcase the firm's latest home innovations. I found the Kitchen display a bit out of place in the technology haven. But that's just me. The help desk provides customer support and troubleshooting for cracked screens, battery issues, or, like me, stylus problems. Be prepared to catch a bit of attitude with your tech support.